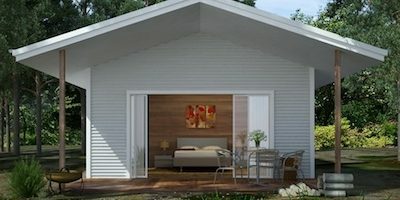 This simple yet effective studio granny flat / chalet design is the best value “granny flat” in Western Australia. In fact, it is possibly the only fully-built turn-key design for less than $100K in the state. 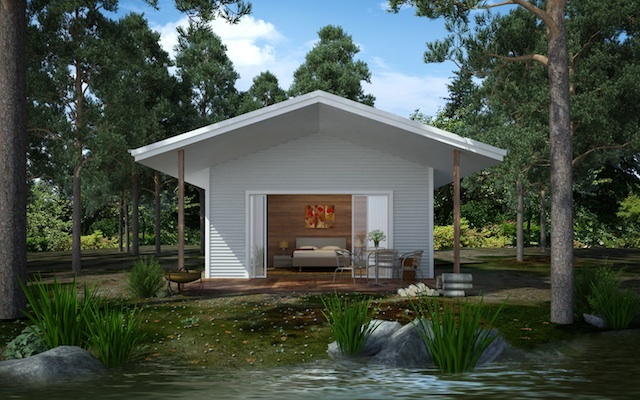 This is a compact studio design granny flat, garden chalet, or independent living unit. 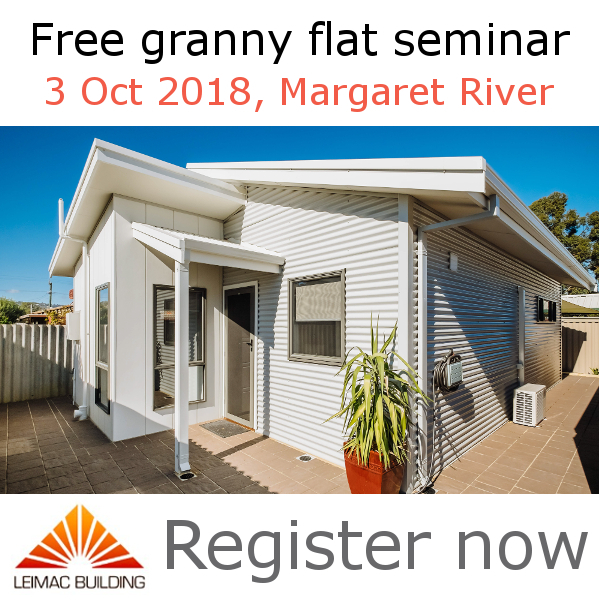 It is popular with clients seeking quality-built, cost-effective tourist accommodation or back yard granny flat developments. Or, it could simply be a “getaway” cabin for those who like “glamping” by the river. Double entry doors open directly into the light and airy studio living / bed space, with a small kitchenette and robe located discreetly behind a dividing wall. The well-appointed bathroom is spacious, and with the right fittings and finishes could be as luxurious as you design it to be. This is a free-standing chalet and can be positioned to face north no matter which direction your view – all that’s required is to strategically place windows to take advantage of wherever the view may be! Assuming minimal site works, we aim to build this to suit any block in the Margaret River region from $99K. Again, every site is different, and every owner’s preferences and requirements are different, so these prices are indicative only. They are also subject to change depending on supplier and market conditions. All lock-up materials ready to be built on owner’s concrete slab (excluding verandah paving). All external doors and windows (aluminium). Internal linings (Gyprock and Villaboard). Bathroom, kitchenette and laundry tiles (standard selections). Doors, door frames and door furniture. Single bowl sink and under-bench fridge cavity. Shelving for robes and linen cupboards. Vinyl coated sliding robe doors (standard colour). 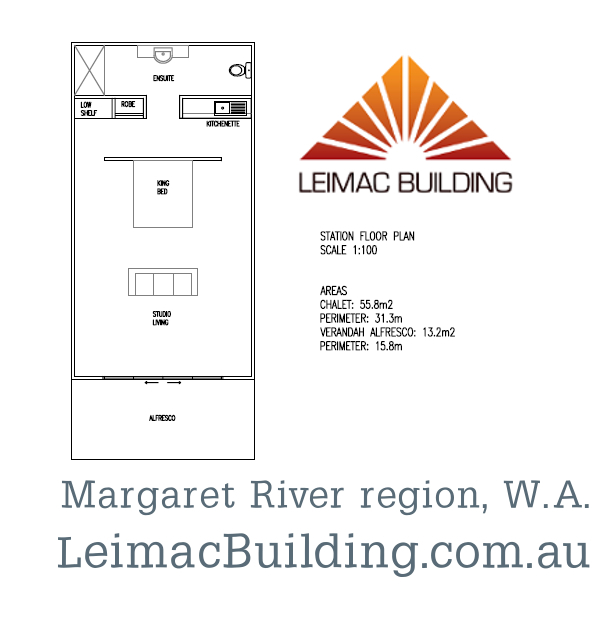 Contact Leimac Building, your local independent builder in the South West for an obligation-free chat: Ph 08 97 555 900.